The delivery of Alya McCall is significant in that it is the first vessel in a fleet of new class monohull Fast Support Vessels (FSV) for SEACOR Marine. Alya McCall is the first vessel in the SEACOR Express Plus class and features striking lines not ordinarily found in traditional monohull FSV designs. Gulf Craft in Franklin, La. built the 206 x 43 x 9.25 ft. vessel. Alya McCall features seating capacity for 100 personnel and has a top speed of 38 knots. The performance is enabled by five Cummins QSK 60, EPA Tier 3 compliant diesel engines, each producing 2680 bhp. The engines are coupled to Twin Disc MGX 61500 SC reverse reduction gearboxes that drive Hamilton HT-810 water jets. A cardan shafting system by Driveline Service of Portland connects the gearboxes to the waterjets. Superior station-keeping capability is provided through the combination of three (3) Thrustmaster 30TT200 electric-mechanical tunnel thrusters in working in conjunction with the azimuth-like waterjets, all of which are controlled by a Kongsberg DP-2 dynamic positioning system. Electrical power is derived from three (3) Cummins QSM11 gensets, each producing 290 ekW. Dual FFS firefighting pumps and remoted controlled monitors provide Fifi-1 equivalent firefighting capacity for combatting off-ship fires. A Naiad Dynamics ride control system is also fitted to improve passenger and crew comfort while underway. 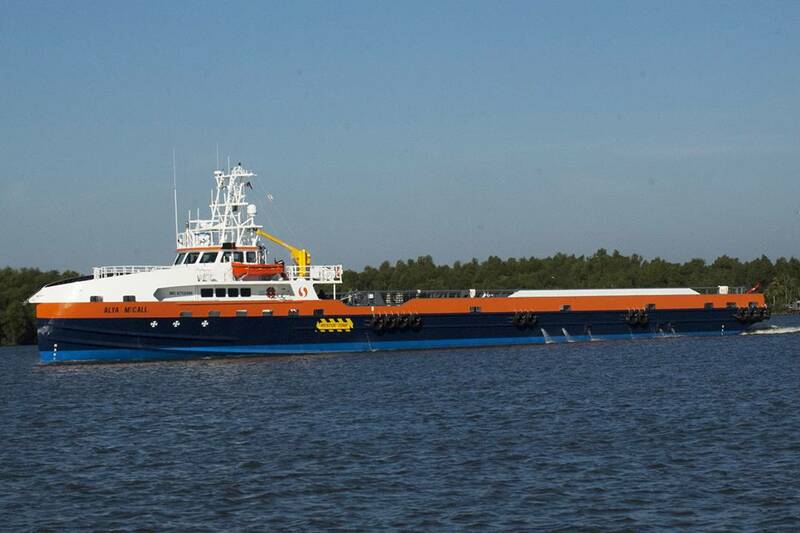 The vessel is certified by the USCG under the provisions of 46 CFR Subchapter T and by the American Bureau of Shipping as a High-Speed Craft with DP-2 and Fire-Fighting Capability notations. Deck Size	136.5 x 26.5 ft.
Deck Area	3530 sq. ft./328 sq. m.